Memorabilia relating to an old garage in Morpeth. Homepage. This page: Illustrated invoice from The Garage at Thropton, dating to 1954. W & J Smith & Son - Motor Engineers. Odd items of garage memorabilia like this shine a light on the type of work that typically came into garage businesses in the early/mid 1950s. 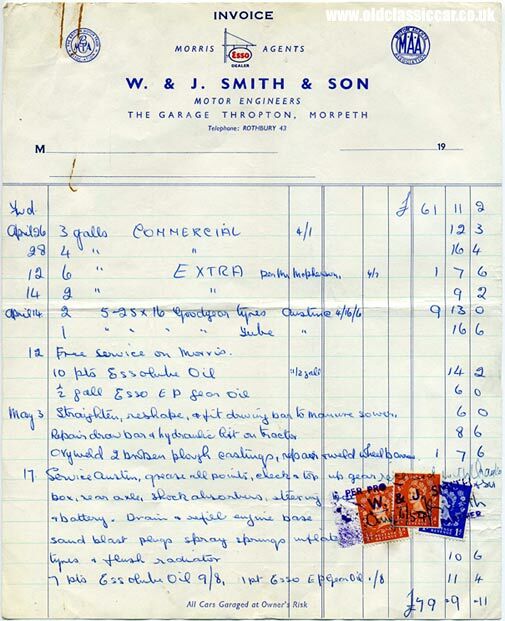 The garage in question is that of W. & J. Smith & Son, of Thropton, Morpeth, and this invoice is one of several that relate to one particular customer, and the business they put W & J Smith's way in 1954. The company at the time was a member of The British Motor Trade Association, and the Motor Agents Association, and also held a franchise for Morris cars (and quite possibly commercial vehicles). Esso fuels and lubricants were also available to the local and passing motorist alike. Unlike with most of the garages featured in this section of the site, the company name of W. & J. Smith still features on the premises referred to in the paperwork shown below, namely "The Garage", in Thropton. The W. & J. Smith garage continues to sell motor fuel, and now incorporates a shop and the local post office. A photo of the premises can be found on this site: geograph.org.uk. Evidently this 1950's customer was a regular visitor for Commercial and Extra motor fuel, and also had servicing work done on their Austin and Morris cars. This page for example refers to the supply of two new 5.25 x 16 crossply tyres to fit the Austin, while on April 12th the Morris received a free service, which required 10 pints of Essolube motor oil, and 1/2 gallon of Esso E.P. gear oil. A month or so later the Austin was in for a service too, where it received a greasing, fluids were topped up or replaced as required, the radiator was flushed, and the spark plugs cleaned. On another invoice, there is reference to a new 6.00x17 Firestone tyre being supplied for an Austin pick-up (possibly an A40 pickup?). The invoices also refer to various agricultural machines that the garage serviced for their customer. On May 3rd they undertook repairs to a manure sower, fixing the hydraulics on a tractor, and welding two damaged castings on a plough. A damaged wheelbarrow also received the attentions of their welding set. In February one of the garage's engineers visited Mrs Waldy to fix a misbehaving Wico magneto on a Petter engine, with a return visit being made a couple of weeks later to de-coke the engine, re-grinding the valves before re-assembly and testing could be achieved. Garage engineers were just that, hands-on mechanics who were willing and able to serve the community however they could, whether it be supplying fuel, maintaining cars, fixing-up farm machinery and even repairing broken wheelbarrows.